This new visualisation is all about the e-mail systems used in Canadian HigherEd. As you can see, Microsoft largely dominates with about 69% of the total market.About 27% are using cloud based services like Google and MS Live. 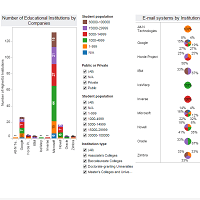 About 20% of Higher Educational Institutions have 2 e-mail systems. One is for students and the other for professors and employees. Of these, almost all (90%) use Microsoft exchange for Professors and employees and MS Live(65%), Google (26%) for the students. What are you using at your educational institution?